When little Mica Mouse is scared by thunder booming outside her cozy home, Papa Mouse reaches for just the right story to comfort her. Hugging her close, he begins to read The Rhino Who Swallowed a Storm. 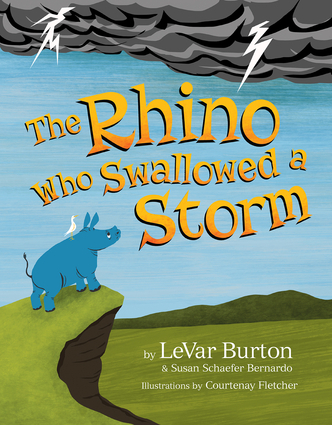 In this poetic book-within-a-book, a happy little rhinoceros is overwhelmed by a storm that sweeps away everything he loves. Swallowing the storm just makes him feel worse, so Rhino sets off on a whimsical journey toward healing. Along the way, he meets many friends, including a kind spider, a brave kangaroo, a wise tortoise, and an uplifting whale. With their help, Rhino lets go of the storm inside and learns to see the light in a world turned gray. Mica Mouse is soothed by the story and Papa's gentle reminder that even though bad things sometimes happen, the world is full of people who care. In his first children's book, longtime Reading Rainbow host LeVar Burton gives us an engaging resource to help children express their feelings and navigate through difficult experiences. The "Take a Deeper Look" page at the end of the book even provides discussion questions to facilitate a healing dialogue. Actor, director, and educator LeVar Burton has been an icon for more than 35 years. 1977's TV miniseries Roots propelled the 19-year-old Burton onto the world stage with his unforgettable performance as Kunta Kinte. As Star Trek: The Next Generation's blind chief engineer Geordi LaForge, Burton reminded audiences that it's not our disabilities but our contribution to society that defines us. However, it's his 31st year as host, producer, and now co-owner of Reading Rainbow where Burton has had his greatest impact, delivering the message of the importance of literacy and reading to generations of children. Coauthor Susan Schaefer Bernardo is a published poet and the author of Sun Kisses, Moon Hugs. Courtenay Fletcher is a designer and the illustrator of Sun Kisses, Moon Hugs.